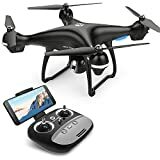 Holy Stone HS100 Drone Review 2019 – is the Holy Stone HS100 quadcopter worth the money? Review of features, pricing, flight duration, battery, camera and more. Holy stone, a Chinese drone maker, has a reputation for producing great budget-friendly drones. Their latest product, the Holy stone HS100, is a drone aimed for the mid-range market segment given its price tag and array of features. This new drone first hit the markets in the final quarter of 2017 and offers excellent upgrades over the company’s previous quadcopters (HS110 and HS200). The stabilized HD camera and built-in GPS make the HS100 a very interesting drone despite its reasonable price tag. On top of that, this drone promises long flight times thanks to its ample battery pack. Below is an in-depth look at the specifications of features of the Holy stone HS100 drone. The HS100 comes with everything you need right out of the box. Below is a list of accessories you’ll find in the item’s shipping package. • Its large and powerful motor allows the drone to breeze through the winds with minimal issues. • Its flight range of 500 meters and max altitude of 120m is quite impressive for a drone of its class. • Charging times of 3 to 6 hours are hard to live with by modern standards. 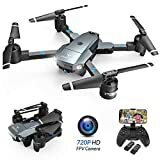 • Its 720p camera leaves a lot to be desired given there are 1080p units in drones within its price range. What are the ideal wind speeds to fly the HS100 in? The manufacturer recommends flying the drone in wind speeds of less than 22 mph. 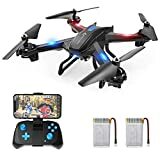 What type of connectors is needed to charge both the drone and controller? The unit’s battery comes with a micro USB connection meaning you only need to have a micro USB cable and a USB power adapter, both of which are included in the shipping box. How well does the drone perform when flown in areas with spotty telephone network? The drone connects with your smartphone via WI-FI send out from its camera, so you need not worry about the quality of telephone network services. The Holy Stone HS100 with dimensions of 19.68″ x 19.68″ x 6.8″ is one of the more massive drones in the mid-range category. With its battery attached, the drone weighs in at 700g, but that shouldn’t be an issue since the unit has a powerful motor to boot. The 720p camera sits beneath the drone with the LEDs under the blades providing adequate illumination. Overall, the HS 100 is quite a looker given its ergonomic design and superb build quality. The HS 100 boasts a ton of cool features that make flying the drone a joy. First off is the GPS navigation feature. The GPS assisted flight guarantees peace of mind by enhancing both safety and location tracking during flight. The GPS aided return to home feature automatically kicks in whenever the battery capacity dips too low or when you go out of range of the transmitter. Next up is the follow me mode which when activated allows the drone to track you, capture footage and take aerial shots as you run or do other cool stuff. Altitude hold is another fantastic feature that enables the drone to fly at a fixed height. Quick launch is also possible with the HS100 thanks to the one key takeoff/landing feature. This feature is activated by a single push of a button and works very well when combined with altitude hold and follow me modes. Headless mode is a feature that beginners and amateur pilots will love. It allows the pilot to handle the quadcopter without having to worry about orientation issues. The HS100 drone comes with a 720p optimized camera with an electronically adjustable 90° tilt. All videos and captured images are saved to its 8GB microSD card which is included in the box. The Holy Stone HS100 has a range of 500 meters when flown in open and unobstructed environments. With FPV mode activated that range reduces to 150 meters. Expect flight times of between 12 to 15 minutes. Both models come with GPS navigation, follow me mode, altitude hold and the return to home feature. Both units also make do with a 720p camera unit. However, the HS100 does have the better build quality, but that’s expected given it’s slightly pricier than the Hubsan X4. These two drones have a flight range of up to 500m. However, the MJX Bugs 3 mini flight time of 18 to 20 minutes is much better than the 12 to 15 minutes in the HS100. Brushless motors on the MJX are powerful and more durable than what you get with the HS100. The HS200 is the predecessor to the new HS100. The HS200 measures in at 12.6″x12.6″ meaning it’s smaller than the HS100. The HS200 has average flight times of 7 to 9 minutes and a range of 100 to 120 meters. Though both units come with 720p camera modules, the HS100 is definitely the better drone. Consumers are impressed with how easy the drone is to set up out of the box. The drone is reportedly stable even when pushed to its limits. Although it lacks 1080p or 4k shooting capabilities, its 720p unit still does a decent job when recording videos. The transmitter is reliable and connects automatically when the drone is in range. The return to home (RTH) feature works very well. The only downside of the HS100 is that its battery takes an awfully long time (3 to 6 hours) to reach full charge. All in all, the Holy stone HS100 is a drone that beginners and novice fliers will love given its easy to fly nature. GPS navigation system is a welcome feature in this price range. Pilots no longer have to worry about losing their drone thanks to its RTH function which is activated by the push of a button. A 1080p camera would have been well appreciated especially given its $275 asking price. However, I would recommend this drone to anybody looking for an exciting, affordable, easy-to-fly drone. 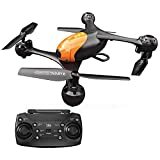 Based upon feedback submitted by over 1300 customers the Holy Stone HS100 Drone has received a 4.6 out of 5 star rating. We discuss why in this review article.